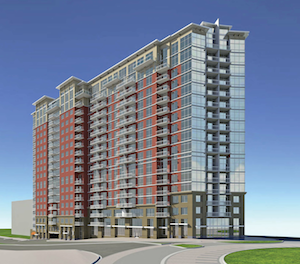 Childress Klein Properties aims to break ground on an 18-story mixed-use building at Music Row’s roundabout in late March, according to the Nashville Post. Childress Klein, which is based in Atlanta and Charlotte, paid $6.25 million for the 1.56 acre piece of land that sits just off the Music Row roundabout between Demonbreun and Division streets. The building will include 431 apartment units and is said to be ready for residents beginning in early 2016. The building will offer an additional 8,000 square feet of street-level retail space for two businesses. According to Childress Klein partner Kelly Dunbar, the company wants a restaurant to be one of the businesses occupying the retail space, as well as a coffee shop or lunch location. Nashville-based Littlejohn Engineering Associates and J.E. Dunn Construction of Brentwood have been enlisted for the project, while Atlanta-based architect Rule Joy Trammell + Rubio has designed the roundabout tower. The 1515 Demonbreun St. address will be located next to the seven-story, currently under-construction 1505 Demonbreun apartment building.